India and the rest of the world must think that Canada has left the kindergarten playroom door open. Mr. Dress Up and his absurd family have done a good job in reducing Canada to a laughing stock on the world stage. 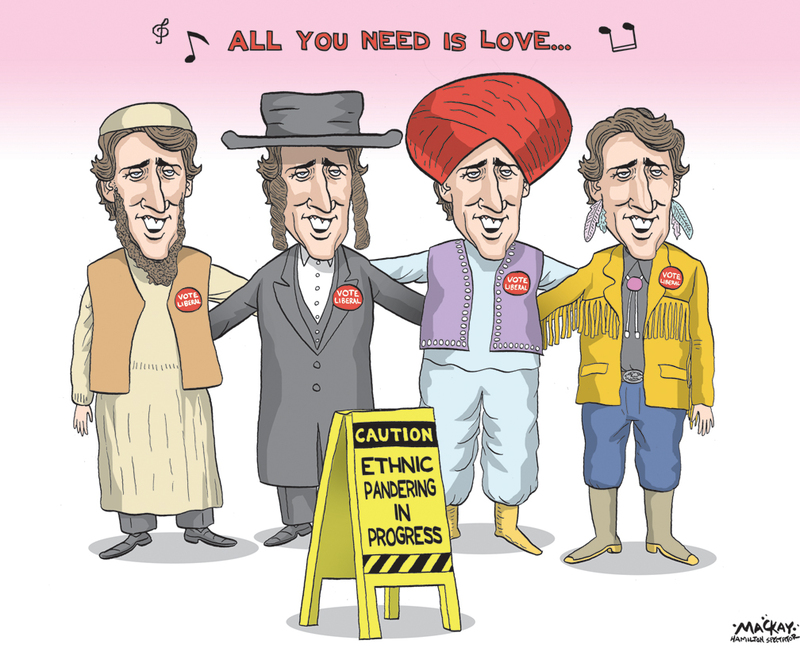 As we are regularly lectured with Liberal bunkum about “cultural appropriation”, how is it that the Premier Mangina thinks it doesn’t apply to him? At the famed U of Zero (aka University of Ottawa) some time ago, odious dwarf and Liberal excrescence Alan Rock, then El Commandante of said institution, ordered yoga classes cancelled because apparently white people should not take them. Nothing like a good bit of anti-white racism to show your Liberal credentials. Naturally, there are rules for Liberals and different rules for everybody else. If the PM wants to pay homage to the absurdities of identity politics, which is anti-white racism in a suit, he should at least be consistent. Did he not think that prancing around India pretending to be an Indian while on an official visit might be viewed as highly insulting by the Indians, or at least a demonstration of foppish vanity that impresses no-one? And to add injury to insult, how smart was it to invite a Sikh terrorist to a diplomatic dinner party? That certainly didn’t impress the Indians. We know he’s pandering for the immigrant vote back home, but this kind of abject crawling, …really? He gives the impression that he only looks in a mirror all day. He thinks vanity is an art form. Even his servile toadies in the Fake News Media and the dead tree press are getting a little cheesed off about it. It may be one of those moments when the reality of the man is exposed. After all, you could wade through his deepest thoughts and not get your ankles wet. A smile and a hairdo may impress the likes of CBC journalists, but Canadians who work for a living expect something better. If anyone is all image and no substance, it is he. Perhaps, for a laugh, visiting Indian diplomats should dress up in Chipewyan Indian headdresses, or lumberjacks in plaid shirts with axes? As some wit on the Internet said, I can’t wait to see him dressed up when he visits Papua New Guinea. When Trudeau visits Iran he is going to chuck a homosexual off a rooftop.